MR images in case 1. A, T1-weighted image (500/16/2) of the brain demonstrates T1 shortening in the bilateral lentiform nuclei (globi pallidi more than the putamina) and insular cortex (arrowheads). Left intraventricular hemorrhage is recognized. B, T2-weighted image (3000/120/1) shows low signal intensity in the left globus pallidus and high signal intensity in the corpora striata and white matter subjacent to the insular cortex (arrowhead). 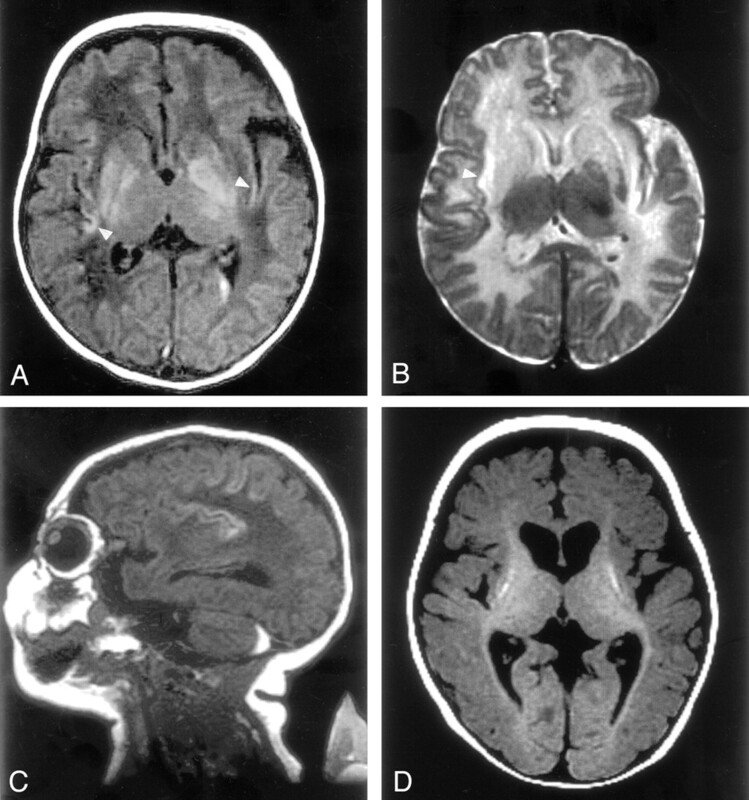 C, Sagittal T1-weighted image shows T1 shortening in the deep sulci of the insular and perirolandic regions and a retrocerebellar subdural hematoma. D, T1-weighted image obtained at the age of 7 months shows volume loss in the basal ganglia with T1 shortening in the putamina, reduced volume of cerebral white matter, and diffuse cortical atrophy. Myelination was recognized in the posterior limb of the internal capsule and in the optic radiation.